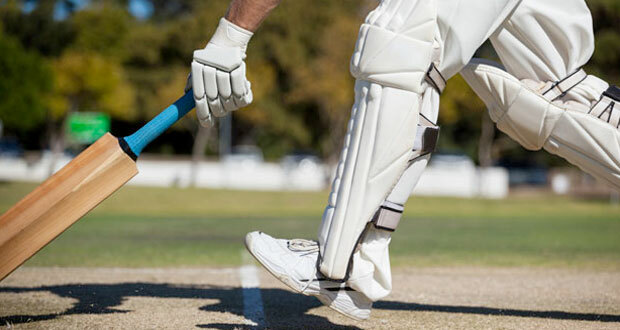 Cricket injuries are either acute injuries which occur suddenly such as a torn muscle, or an impact from the ball. Or they can be chronic injuries which occur gradually through overuse. Contusions are caused by direct impact to the muscle. The most common site for a contusion is a quadriceps muscle contusion, which is sometimes then referred to as a ‘charley horse’ or a ‘dead leg’. Contusions can occur in any muscle, with the hamstrings and calf muscles being other common locations. Read more on how to treat a Contusion. A rotator cuff strain is a tear to any of the four rotator cuff muscles in the shoulder. These muscles are important for stabilizing the shoulder joint. Symptoms of a torn rotator cuff will usually consist of sudden pain in the shoulder sometimes accompanied by a tearing feeling. This can be severe and may transmit down into the arm. Read more on how to treat and rehabilitate a rotator cuff strain. A sprained ankle is one of the most common injuries in sport and is also the most frequently re-injured. In the majority of cases, the ankle rolls inwards (inversion) under the weight of the rest of the body, resulting in damage to the ligaments on the outside of the ankle. Read more on sprained ankle treatment. Medial knee cartilage meniscus injury – A torn meniscus is a tear to the semi-circular cartilage in the knee joint causing pain on the inside of the knee. It is commonly injured through direct impact in contact sports or twisting but can also occur in older athletes through gradual degeneration. Read more on medial meniscus injury treatment. Impingement syndrome of the shoulder is sometimes called swimmer’s shoulder or thrower’s shoulder and is caused by the tendons of the rotator cuff becoming impinged as they pass through the shoulder joint. Symptoms include shoulder pain which comes on gradually over a period of time. Read more on treatment and rehabilitation for Impingement syndrome. Throwers elbow (Golfer’s elbow) or medial epicondylitis is an injury similar to tennis elbow but causing pain on the inside of the elbow instead. It is sometimes known as throwers elbow. Symptoms often come on gradually through overuse although acute injuries can occur to pitchers who throw too hard too soon or with bad technique. Read more on treatment for Golfer’s elbow. Back pain can be particularly difficult to diagnose due to the complexity and the number of structures and tissues in the lower back that can cause pain. The most common causes are slipped discs and this can sometimes cause leg pain called Sciatica. Read more on lower back pain treatment. Should I seek professional treatment? If you have any of the following symptoms you should seek further medical assistance. Altered sensation in the foot – such as a feeling of “pins and needles” (paresthesia) or a “loss of feeling” (anaesthesia). Unable to complete normal daily activities after the initial 72 hours. Further medical assistance can be sought through either your local GP or a private clinician such as a podiatrist, physiotherapist, sports therapist, osteopath or chiropractor. If you have followed the P.R.I.C.E. principles (see below) and are still unable to walk after 72 hours or still have severe pain that is not subsiding after the first 72 hours you should visit your local A&E department for further assessment. Secondly, if you have applied for P.R.I.C.E. principles and still have weakness that lasts a long time (more than 2 weeks) or have ongoing discomfort in your foot or heel, you are highly recommended to seek advice from a specialist expert – such as a podiatrist or physiotherapist, osteopath, or chiropractor – who can provide you with advice and an appropriate and effective recovery and rehabilitation program. The PRICE principles are the gold standard set for treating acute sports injuries. The acronym stands for Protection, Rest, Ice, Compression and Elevation and should be applied as early as possible and continued for at least the first 24-72 hours. Protection of the damaged tissue is vital to prevent further damage and enable the healing process to start efficiently and effectively. There are a number of ways to protect the injured area all with the same aim of limiting further movement and use of the joint/muscle/ligament/tendon. One way this can be achieved is by using a support or splint. In the early stages, rest is one of the most important components of the P.R.I.C.E principle but is often neglected or ignored. It does not only refer to the prolonged period of time that the athlete will be out of action but also to the immediate period after the injury. An athlete must know when to stop training and allow the injured area to heal otherwise repetitive minor injuries can often result in a more severe injury that keeps the athlete out for much longer. If an injury is sustained during sporting activity some athletes have a tendency to ‘run it off’. This implies that by continuing to participate in the exercise, the injury will simply go away. In fact, in the majority of cases, this is not true and is not advisable. Ice therapy, also known as cryotherapy, is one of the most widely known and used treatment modalities for acute sports injuries. It is cheap, easy to use and requires very little time to or expertise to prepare. Decreases the amount of bleeding by closing down the blood vessels (called vasoconstriction). Ice is usually applied to the injured site by means of a bag filled with crushed ice which is wrapped in a damp towel. The damp towel is essential as it forms a barrier between the bag of ice and the skin and reduces the risk of an “ice burn”. DO NOT leave the ice on for more than 15 minutes as you could cause an “ice burn”. There are a small number of areas that you should not apply ice to which include the neck, the outside bone of the elbow, the collarbone (upper end), the front of the hip (bony part) and the outer bone of the knee. The reason for this is there is a superficial nerve just below the skin in these areas that can be damaged by applying ice to it. Always check for contraindications. Applying compression to an injured area minimises the amount of swelling that forms after an injury in two ways and should be applied for the first 24 to 72 hours from the onset of injury. Compression can be applied through a number of methods. The most effective of these is by using a compression bandage which is an elasticated bandage that simply fits around the affected limb. Elevation of the injured limb is the final principle of PRICE but is equally as important as the other 4. Elevation allows gravity to drain the fluid away from the injured site. This aids in decreasing the swelling which in turn may decrease the pain associated with the oedema (swelling). Cricketers are becoming fitter and are able to put their bodies under more strain in the course of the game. Injuries usually occur by one of two methods; those caused by overuse and those caused suddenly by impact or uncoordinated movement. Regular sports massage and a good diet. Increase the temperature of muscles – they work better at a temperature of 40 degrees. Increase blood flow and oxygen to muscles. Increase the speed of nerve impulses – making you faster. Warm up will not only help avoid injury but will also improve performance. Gentle jog to circulate blood and oxygen supplying the muscles with more energy to work with. Stretching to increase the range of motion at joints. Emphasis should be placed on stretching the lower back, shoulders, hamstrings and calf muscles – but do not neglect the rest. The warm-up should last around 10 – 15 minutes. If you are in the field for long periods of time, keep warm, stay mobile and stretch regularly. If you have to wait a long time before batting, the same applies. Circulate blood and oxygen to muscles, restoring them to the condition they were in before exercise. Remove waste products such as lactic acid. Reduce the risk of muscle soreness. The cooldown should consist of a gentle jog followed by light stretching. The wearing of protective equipment is especially important to the batter and wicketkeeper in cricket. The batter should wear a helmet with face guard, leg pads, gloves, and a box or cup. The wicketkeeper usually wears a helmet and gloves. Getting a regular sports massage can flush the muscles of waste products and release tight knots, lumps, and bumps in muscles that if left may cause strains and tears. It is possible for a good sports massage therapist to identify potential trouble spots long before they become injuries. Carbohydrate is important for refueling muscles. If you become dehydrated then less blood will flow through muscles. The muscles will be more prone to injury. Vitamins and minerals are required for a number of reasons related to recovery. Much of what is discussed above should be part of your sporting routine. A biomechanical analysis can help identify possible injury risks. Assessment from a sports therapist or specialist can identify weak areas and possible injury risks. A course of exercises specific to your needs can give you the best chance of avoiding injury. Not allowing your body to recover properly from training will eventually result in injury. Your body needs time to rebuild itself stronger before the next training session. Remember – you are not training when you are training, you are training when you recover! Sleep is also an important part of your training. If you are not getting enough, get it sorted.